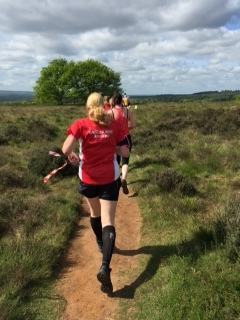 This weekend heralded a hectic few days of running activities for the club, with SJs spread out in all the corners of the UK taking part in a wide variety of events from a 250th Parkrun (250!!!) to an epic 50 mile ultra. Running solo, in supportive pairs and pretty much in gangs, we’ve conquered all sorts of terrains and smashed a few PBs. It is weekends like this that remind me of what a diverse and varied bunch we really are. No matter how commonplace or completely bonkers an event is, the chances are that you’ll find another like-minded soul in SJ willing to pull their sports socks on and run next to you (hopefully wearing trainers as well). 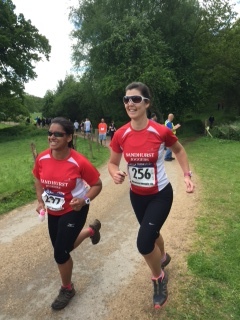 It is often said that running is a lonely sport – those people have never met any of our runners – we run at different paces, we like running different distances, but mostly we like doing it all en masse. After all the excitement of the live Green Belt Relay blogs I’m taking a few days break before jumping back on the blog bandwagon at the weekend. In short you’ve got a few days to entertain yourselves! 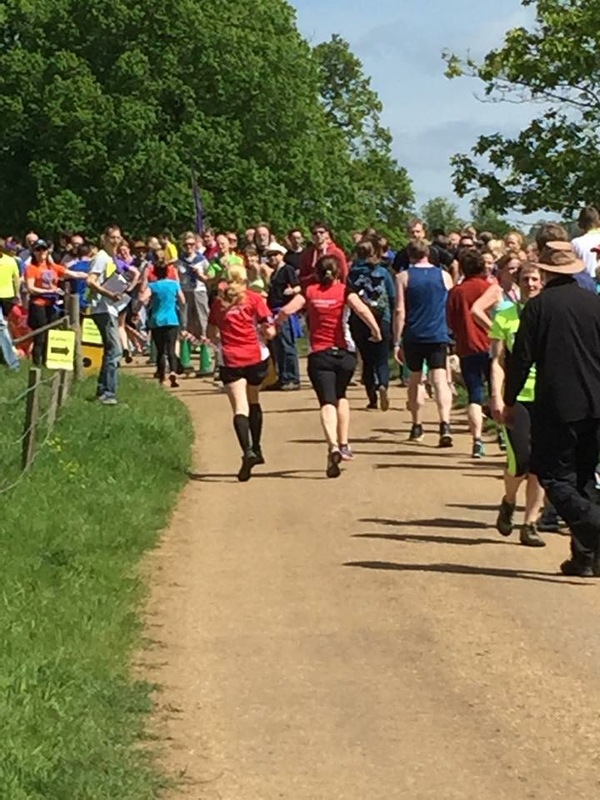 However, to ease you in gently and give you your running fix for today, here is a great race report from Madeleine on the Woodland Woggle – which probably has one of the best 10k race titles .in the local area! 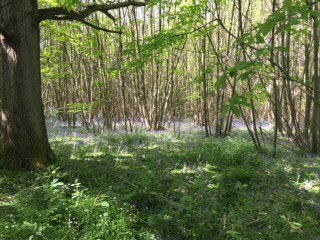 With the promise of an ‘undulating’ 10k bluebell run in the Surrey hills, I decided to give it a go. 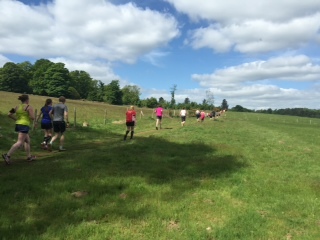 The race was in the grounds of the beautiful Hampton Estate, near the Hogs back. The sun was out with a cool breeze, perfect conditions. I picked up Tracy Buck on the way and met up with Monica, Tanya, Jim Casey, Nigel and birthday girl Helen Vizard in the car park. A short walk from there to the barn to collect our race numbers, close enough to pop back to the car to lose a layer closer to the start time. 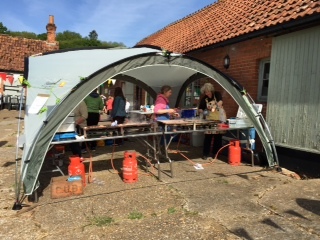 The smell of bacon was already tantalising and the atmosphere friendly. There was also a 6k walk which attracted lots of families and dog walkers. We were all led together to the start, a 5 minute walk away. A low key start and we were off. 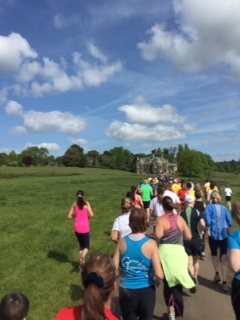 The run starts past a beautiful house covered in stunning wisteria and then shortly after splits the runners and walkers in different directions. After approx half a mile we turned and started up a cheeky little hill, who put that there? I hadn’t realised that is would be the smallest hill we would encounter! 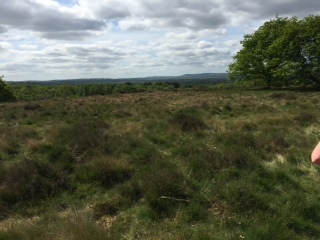 The terrain was varied and a bit challenging but with beautiful views at the top of each hill. 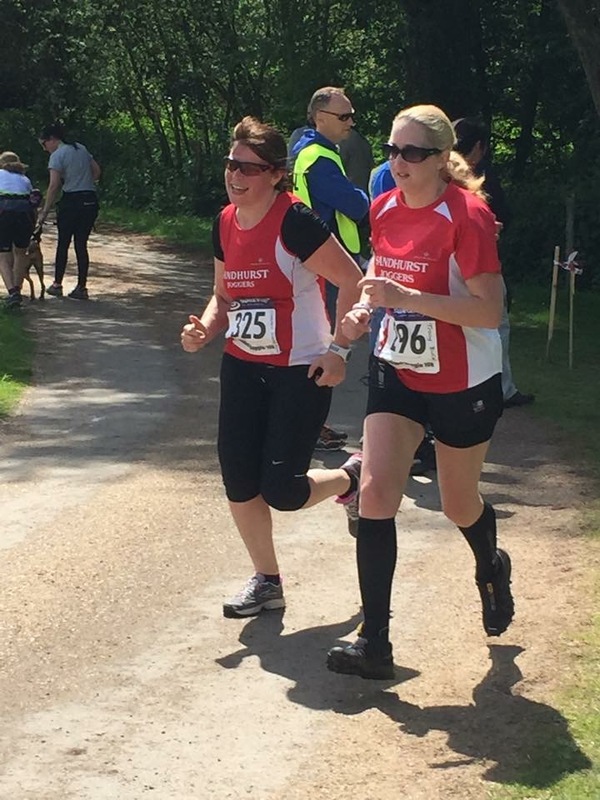 Tracy and I ran together the whole way and went for a ‘Royston and Jackie style’ hand in hand finish. Jim and Nigel cheered us in and we joined them to welcome Monica and Tanya, who smiled all the way to the line! 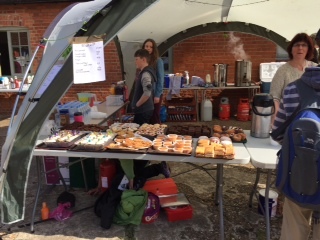 We then followed our nose to the queue for the welcome bacon butties, very tasty and a reasonable £1.50 each! A great day out, I’d definitely do it again. 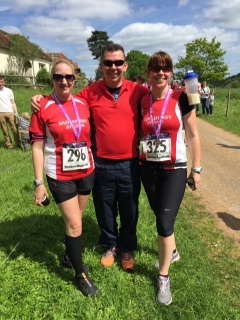 The good – the views, friendly marshals and the butties! 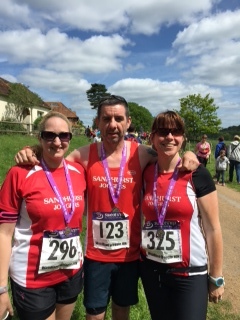 The ugly – actually we aren’t that bad… The SJ gang before the race!